Ludlow’s Coder Road: a centre of excellence for a town that thinks green? So what’s the future of Coder Road? The biodigester is shut down. The recycling centre is closed. And at the beginning of October, the highways depot shuts when the Ringway team moves to Craven Arms. But, as reported recently in the press, there is hope that this sector of Ludlow could become a “recycling park” or at least something like that. Tonight, Ludlow MP Philip Dunne hosted a meeting at the biodigester. The meeting was organised by Adam Kennerley of Cwm Harry who drew together local councillors and key actors in social enterprises, green businesses and education around Ludlow. The meeting was exactly held under Chatham House rules of confidentiality, but it wasn’t a public meeting and I can’t report it in detail. This was a very constructive meeting. 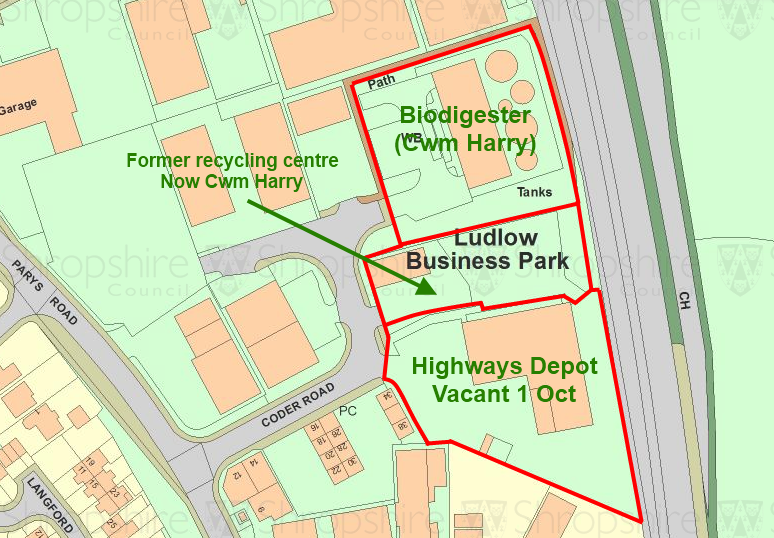 It discussed the potential for the three sites: the biodigester, currently inactive but managed by Cwm Harry; the former recycling centre, also managed by Cwm Harry; and the highways depot. The dissenting opinions came from those unlikely to be directly involved. The divergent views were healthy, looking at different ways of making a scheme work. As the meeting closed, it seemed to me there is every possibility of a project emerging that will create a centre of excellence in the green economy, perhaps centred on anaerobic digestion. What we need is a little bit of patience from Shropshire Council to allow time for ideas to develop. If they go for a quick sale, they could undermine these fledgling plans which could put the stamp on Ludlow as a town that thinks green and works green. To be clear, although many of the ideas expressed last night concerned recycling and the circular economy, there are no plans to recreate the recycling facility and tip on Coder Road that we so miss. People from Ludlow and Clee will still have to take their bulky recyclables and waste to Craven Arms.